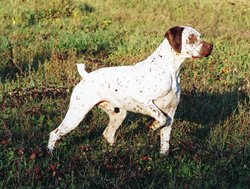 The Braque du Bourbonnais originated in France, and is a gun dog of rustic appearance, born with a short tail, and with a short, ticked coat with liver or fawn coloring. 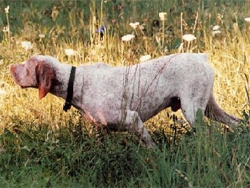 The Braque du Bourbonnais is a dog of smaller stature, and is well suited for hunting upland game as well as waterfowl. An ancient French pointing dog, it was first described by authors in 1598 as a "pleasant companion of the hunter". In the early 1900’s, breeders of the Braque du Bourbonnais attempted to introduce a new, faded lilac color to the breed and to produce natural bob tails. These fads put the existence of the breed in danger, but today the breed is in good hands. The Braque du Bourbonnais was recognized by the United Kennel Club in 2006. The Braque du Bourbonnais is a kind and affectionate companion as well as a passionate and intelligent hunter, suitable to hunting a variety of game and terrain. This makes them very versatile for hunting upland game or hunting for waterfowl. Additional breed information for the Braque du Bourbonnais can be found at the United Kennel Club website.